From diagnosing cancer to analyzing petroleum: The analytica conference is the scientific highlight of analytica. It takes place on the first three days of the fair, i.e. from May 10 to 12, at the ICM—Internationales Congress Center München (ICM) directly next to the exhibition halls. Whether it comes to food or environmental analysis, diagnostics or the constant ongoing development of chromatography, spectroscopy and other analysis techniques: The analytica conference features some 130 lectures that cover the entire range of topics in analytical chemistry and bioanalysis. Its speakers and chairs include eminent experts such as Gary Hieftje and John Yates III from the Unites States, Luigi Mondello from Italy, Peter Schoenmakers from the Netherlands and Andreas Manz and Hans Maurer from Germany. According to The Analytical Scientist magazine, they were all among the world's 100 most important analysts in the year 2015. The analytica conference not only gives participants a comprehensive overview of modern analysis, it also picks up on general topics that have social relevance. For example, this year's conference features two symposia about strategic raw materials: “Resource Analysis” on the afternoon of Tuesday, May 10, focuses on analyzing high-tech materials and other inorganic raw materials. The first lecture in this series will be held by Kim H. Esbensen from the Geological Survey of Denmark and Greenland. He is considered an absolute expert when it comes to representative sampling—which ultimately is the essential element when analyzing ores and other heterogeneous base materials. Speakers at the full-day session on “Energy & Fuel” on Wednesday, May 11, will include scientists from Great Britain, the United States, Russia, Belgium and Germany as well as representatives of the petroleum industry. Frans G. A. Van den Berg from Shell Global Solutions International in the Netherlands will discuss characterizing crude oil, and Pierre Giusti from TOTAL Refining and Chemicals in France will talk about fingerprint analysis of petroleum and polymers. A presentation titled “Your petroleum may be quite different from what electrospray-mass spectrometry makes you believe” by Jan Andersson from the University of Münster should also be exciting. Analyzing nanoparticles is another focal point of the analytica conference. On Wednesday, May 11, “Analytical and Bioanalytical Chemistry (ABC)” magazine is hosting a full-day symposium titled “ABC’s Spotlight on the Nanoworld”. Ten renowned international speakers will discuss detecting nanoparticles on the one hand and the advantages of nanotechnology for analysis on the other. For example, Lihua Zhang from the Chinese Academy of Science will discuss functionalized nanoparticles for sample preparation in protein analysis. Detecting nanoparticles in biosamples will also be the focus of a session titled “New strategies in modern spectroscopy” on Thursday, May 12. Molecular microscopy, which combines spectroscopy and imaging, is helpful here because, in addition to images, it also supplies chemical information. Bioscientists can also look forward to a diverse program of events. Besides a session on the hot topic of lab-on-a-chip on the morning of Thursday, May 12, organized by miniaturization expert Andreas Manz from Saarland University, and on imaging techniques on Thursday afternoon, there will be a series of omics lectures including a symposium on metabolomics in personalized medicine on the afternoon of Tuesday, May 10. The fact that omics techniques have also made their way into food analysis will be demonstrated by the session on “Foodomics” on Tuesday morning. For example, it will report on pesticide metabolomics, i.e. the ability to detect all of a pesticide's metabolites by coupling chromatography with mass spectrometry. Spanish food scientist Alejandro Cifuentes, who coined the term “foodomics”, will explain his choice of words in an introductory presentation. On Tuesday afternoon, the second symposium on food analysis is titled “Emerging Contaminants”: It will report on contaminants that have not gotten much attention until now such as pyrrolizidine alkaloids, mycotoxin metabolites and perfluoroalkylated substances. Among other things, this year's diagnostics sessions will focus on the common disease cancer. The session on “Liquid Profiling/Liquid Biopsy” on the morning of the first day of the fair is dedicated to circulating tumor DNA, tumor markers and detecting cancer cells in blood. The session on clinical and forensic toxicology led by “designer drug detective” Hans Maurer from Saarland University on the morning of Wednesday, May 11, is a must for all drug analysts. On the other hand, those who are interested in steroids in bodily fluids and hair should be sure to attend the lecture by Alexander Gaudl from Leipzig University on Tuesday afternoon. In another session on Tuesday afternoon, Mario Thevis from the German Sport University in Cologne will present examples of doping analysis in sports. The above-mentioned sessions are just an excerpt from the extensive program of events. There will also be a full-day session on modern separation techniques as well as sessions on monitoring bioprocesses, sewage analysis, electroanalysis methods and general topics such as laboratory management and data evaluation. The analytica conference's organizers—i.e. the German Chemical Society (GDCh), the Society for Biochemistry and Molecular Biology (GBM) and the German Society for Clinical Chemistry and Laboratory Medicine (DGKL)—also invite everyone to think outside the box. For instance, on the morning of the first day of the conference, why not attend the lecture by Eva Krupp from the University of Aberdeen about mercury in the brains of stranded whales and then join her in a discussion about whether the toxic metal may have disoriented the marine animals. 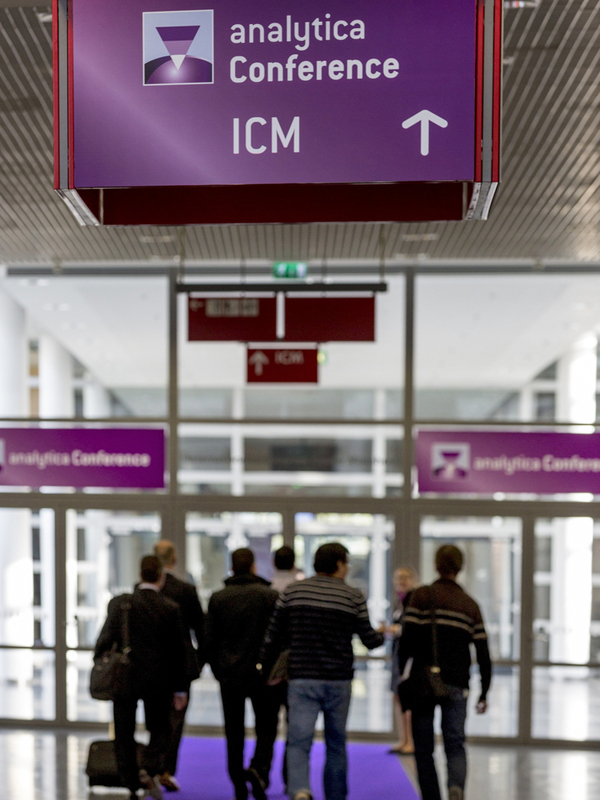 In short: The analytica conference has something to offer everyone. Participation is free of charge for visitors attending analytica. The analytica conference preview can be used for editorial purposes free of charge; the source “analytica/Messe München” has to be named. Pictures can be requested at presse@analytica.de Voucher copy requested.